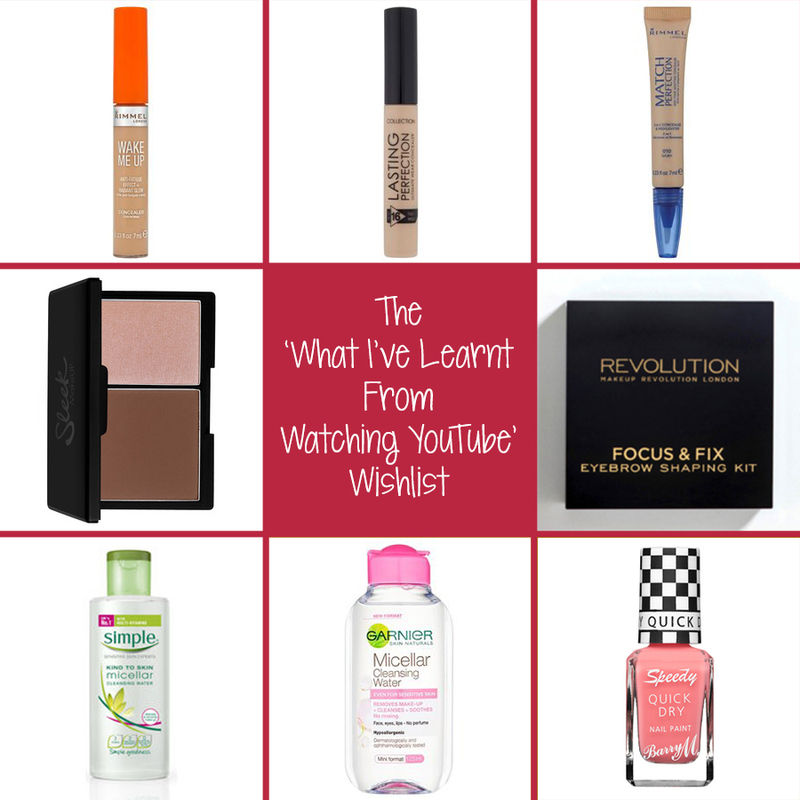 Recently I have become obsessed with watching YouTube and in particular I have watched a ton of make up hauls, reviews and tutorials from the likes of Tanya Burr, Zoella, Velvetgh0st and more. Make up is not my strong point in the slightest but I have become a lot more interested in it lately and I'd like to think my skills are improving. Naturally my latest obsession has lead to a huge wish list of products so I decided I would share some of these with you today. First up is concealer. I have dabbled with concealer in the past but I never really understood the importance of it. I've learnt that a good concealer should cover up blemishes and lighten under the eye area. Everyone has been raving about the Collection Lasting Perfection concealer which is apparently great for coverage. Another recommendation is the Rimmel Wake Me Up concealer which Zoella uses however after looking into buying it myself I've realised that the lightest shade is probably too dark for my very pale skin. Tanya Burr uses the Rimmel Match Perfection in Ivory, which also happens to be the foundation that I use so I've decided to add that one to my basket. Next I'd like to try both a bronzer and a highlighter. I used to use bronzer quite a lot but now I've switched to blusher, little did I know that most people use both! You can use a bronzer below your cheekbones and around the sides of your face and then use a highlighter on your cheekbones and brow bone. I don't think I'm ready for a full on contoured look but I do like the idea of giving my face more of a 'glow'. I know Benefit do some fantastic products for this but they are a little pricey for me unfortunately. The product I'm after is the Sleek contour palette in the Light shade as I love the idea of having both products in one convenient palette. I have only just started doing anything at all to my eyebrows (I know *shock, horror*) and I've not been 100% happy with the result. I currently use the Rimmel Eyebrow Pencil however I've learnt that a better result can be achieved using a powder and an angled brush. There are quite a few different eyebrow kits on the market available in light and dark shades but I love the look of the Make Up Revolution one as it comes with four handy colours and a set of shaping tools too. Finally on my wish list is Micellar water! I have seen these about but I have yet to pick one up. Everyone seems to be using either the Garnier version or the Simple one, I don't have a preference so I'll probably pick up whichever is on offer at the time. This cleansing water is supposed to work miracles in taking your make up off and leaving your skin feeling soft without the need for cream cleaners or all that jazz. It's also really easy to use using a cotton pad and very effective too. *Bonus Product* I can't remember if I saw the Barry M Speedy range on YouTube or not, I feel like I did but it might have been on one of the blogs I follow I'm not sure. However, I absolutely adore this colour which is called 'In A Heartbeat' and most of the other colours in the range too so I just had to add it in! All of these products are available in Superdrug and are definitely not going to blow the budget unless you buy them all at once! I'm also looking for a budget primer if you guys think it is worth using one - some vloggers do, some don't so I'm not convinced and I can't seem to find a cheap one that has good reviews! I hope you've enjoyed this little roundup of products I've discovered from my 'research'!